The U.S. Postal Service is committed to providing customers with real-time visibility and control of their mail and package delivery services. 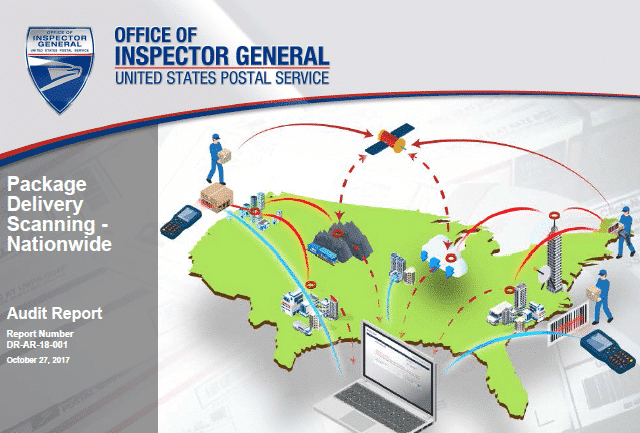 The Postal Service’s goal is to scan all barcoded mailpieces (flats, letters, and packages) that enter the mailstream and track those items with additional scans up to the point of delivery. Scanning accuracy is critically important to the success of real-time visibility. The Postal Service’s scanned package volume increased from 3.5 billion in fiscal year (FY) 2015 to 4.3 billion in FY 2016 – an increase of 22 percent. From July 1 through December 31, 2016, the Postal Service scanned over 2 billion packages sent to over 136 million delivery locations on over 227,092 routes throughout the country. The Postal Service measures package delivery service performance from the point of acceptance through first delivery attempt. When a carrier attempts to deliver a package at the delivery location, it gets a stop-the-clock scan, indicating the Postal Service has completed its commitment to deliver or attempt to deliver the package. Carriers use a handheld Mobile Delivery Device (MDD) to scan and transmit package tracking data. MDDs use a cellular network and Global Positioning System (GPS) technology to obtain real-time delivery tracking and location information. If an MDD is not available, carriers can use the predecessor, Intelligent Mail® Device (IMD). However, the IMD does not provide GPS data or real-time delivery tracking information. Carriers use an MDD to perform stop-the-clock scans for packages at the actual delivery location in order for customers to receive accurate package tracking notifications in real-time. These stop-the-clock scans performed at any location other than the designated delivery location (excluding caller service, vacation holds, post office box deliveries, undeliverable as addressed, and business closed) are considered improper. Delivery unit management use several Product Tracking and Reporting System daily reports for managing scanning status and performance for their unit, including the Start-of-Day, End-of-Day, and Scan Data Integrity reports. This audit was self-initiated based on our data analytics indicating an increasing number of questionable or improper delivery scans occurring at delivery units and about 1.4 million customer complaints in FY 2017 related to delivery. Our objective was to assess the package delivery scanning process in city delivery operations. Opportunities exist to improve the Postal Service’s package scanning processes in delivery operations to minimize improper delivery scans. Of the 2 billion scans for the period July 1 through December 31, 2016, we identified 25.5 million scans that occurred between 7 p.m. and when the carrier clocked out for delivery the following morning. We used GPS location data to further analyze these 25.5 million scans and found that, of these, 15.3 million (60 percent) were performed at a location outside of the delivery unit, therefore we did not identify them as improper. However, about 1.9 million scans (7 percent) were improper stop-the-clock scans that occurred at delivery units instead of at the delivery location. An additional 8.3 million of the 25.5 million delivery scans (33 percent) had no corresponding location data. For these 8.3 million scans, carriers used MDDs for 2.3 million of the scans and IMDs for 6 million of the scans. While the IMDs do not provide GPS data, we estimate the lack of location data for a majority of the 2.3 million MDD scans was due to GPS signal obstruction. Therefore, it was not possible to determine if the 8.3 million scans were proper or improper. Delivery unit personnel did not always follow proper scanning procedures. Employees sometimes experienced technical limitations with the MDDs, including delayed transmissions and signal obstruction. Management’s oversight tool, the Scan Data Integrity report, does not identify all improper scan events such as those that can occur at the delivery unit. Lastly, we identified 105 million scans (5 percent of the total number of scans in the period reviewed) performed using [redacted]. This occurred because the scanners [redacted]. Management has taken or initiated corrective actions to address these issues; therefore, we will not make recommendations in these areas. Customers rely on accurate data to track their packages in real-time and receive notification of an expected delivery window. By improving scanning operations, the Postal Service can improve delivery performance and reduce customer delivery complaints, while meeting the goal of providing customers with real-time visibility over their mail. Continue to reinforce the importance of adhering to package scanning guidelines and policies. Develop a process that will allow carriers to scan multiple packages to a single delivery address to provide accurate delivery information to customers. Review results of the Delivery Partners Program for colleges and universities and the USPS Partner Mobile Application Pilot and consider implementing any best practices for drop houses. Develop an MDD warning message/alert to deter scans at delivery units. Update the Scan Data Integrity report to track improper scans performed at delivery units. This entry was posted in General Union Business and tagged city delivery operations, GPS, MDD, Package Delivery Scanning, real-time visibility, scanned package volume, service performance, stop-the-clock scan, USPS OIG Audit Report. Bookmark the permalink.